Jane is back with an all new career. On a recent trip to Africa, Jane was appalled at the pollution that was destroying the habitats of wild animals. 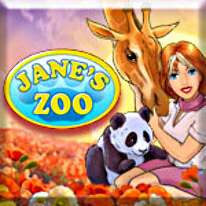 Determined to make a difference, she created Jane's Zoo - sanctuaries for animals whose homes have been destroyed by man's carelessness. You will travel across Europe, Asia and Africa saving baby animals (and watching them grow up!). Different weather conditions and a bunch of fun mini games will keep you hopping as you save the animal kingdom in Jane's Zoo!